Records obtained from the Broward Sheriff's Office reveal that the number of times police were warned about Nikolas Cruz happened far more than they are claiming. 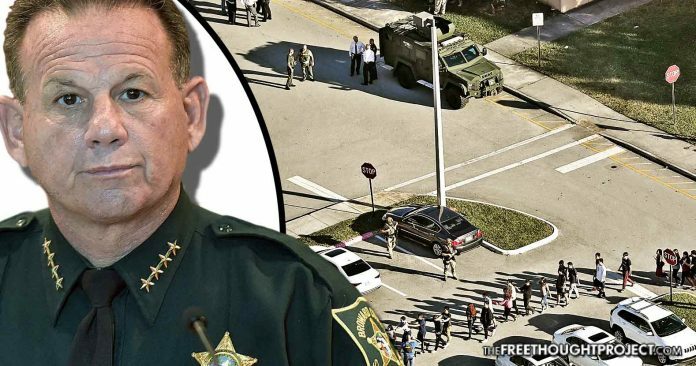 Parkland, FL — As more information continues to come out on the utter failure of police and FBI in stopping the overt and obvious threat that was Nikolas Cruz, it now appears that the public is being deceived. According to records, obtained from the Broward County Sheriff’s Office, police were told about the Florida shooter nearly twice as much as they’ve admitted. According to the report, the sheriff’s office has repeatedly refused to answer questions in regard to the glaring difference in what their records show versus what they are telling the public. Instead, they have doubled down on the original number. On Feb. 15, CNN received a Broward County Sheriff’s Office log based on a public records request showing 39 calls from Cruz’s house over a six-year period. During CNN’s town hall on the Parkland school shooting last Wednesday, NRA representative Dana Loesch confronted Sheriff Israel about those 39 calls, though she inaccurately described them as being 39 visits from police in one year. What’s more, over the weekend, the sheriff’s office again stated the lower number instead of what the actual report from their own department shows and claimed that the 39 number was not true. “Since 2008, BSO responded to 23 incidents where previous contact was made with the killer or his family. STOP REPORTING 39; IT’S SIMPLY NOT TRUE,” read the statement from the sheriff’s office. According to the department’s own logs, however, which show the calls, the Broward County Sheriff’s Office actually received 45 calls in the past in relation to the Cruz household. The documents in question include call logs from the law enforcement agency’s “computer aided dispatch” system. The records list police calls from the home at 6166 Northwest 80th Terrace in Parkland, Florida, which was the home owned by Nikolas Cruz’s mother during that time period, according to property deeds. The calls about Cruz’s unstable behavior have been pouring into the Sheriff’s office since he was only 9-years-old. The breakdown of the total number of calls shows that his brother was just as unstable as police received calls that he hit his mother and ran away. Calls relating to Nikolas Cruz include descriptions of fights with his brother, cursing at his mother, and throwing her against the wall for taking away his Xbox. The issues brought to the sheriff’s attention worsen over time. In 2014, someone accused him of shooting a chicken with a BB gun. According to the records, in 2016, a neighbor warned police that Cruz posted on Instagram that he said he “planned to shoot up the school.” The person who made that call came forward this week and said that she begged the sheriff’s office to intervene. Instead of intervening though, police told her that they couldn’t act until Cruz actually did something. The utter failure of law enforcement in this tragic incident proves that no matter how much police state action is in place—even when police are warned multiple times ahead of time—it can and will fail. When asked if he takes any responsibility for the horrendous botch by his department which led to the deaths of 17 innocent children and adults, Sheriff Israel said he’s done an ‘amazing’ job. “I can only take responsibility for what I knew about. I exercised my due diligence. I have given amazing leadership to this agency,” Israel said.